How well do you know your computer? Do you think you can name all the parts and how it fits together? Sally and Peter are trying to complete this crossword puzzle, but keep getting a bit stuck. Do you think you can help them put the right words in the boxes? All the clues are on the puzzle and the answers are all computer related - why not have a go and see how much you really know about your PC! 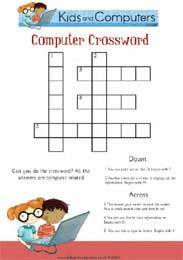 Why not Download the Computer Crossword Puzzle and see if you can figure out which words go where. @slm - thanks for highlighting the problem - we are looking into this. The crossword puzzle down loan is blank!